This shop has been compensated by Collective Bias, Inc. and its advertiser. All opinions are mine alone. #PassThePepper #CollectiveBias. We watch a lot of college football at my house. I’m sure we’ll watch even more when my oldest son heads off to college next fall! We’re already getting excited for the College Championship game coming up on January 12 and planning some one of a kind snacks for our homegating experience. 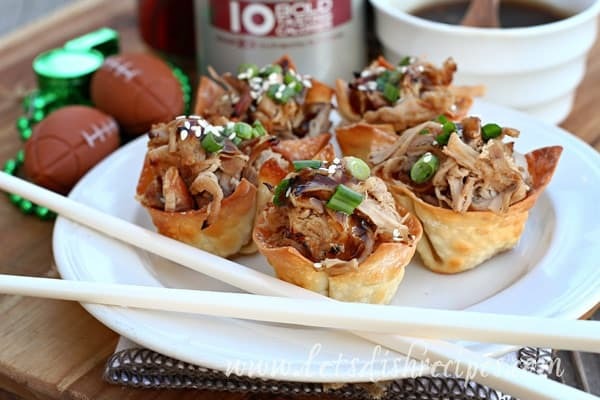 These Pulled Pork Wonton Cups with Dr Pepper Glaze will definitely be on our game day menu. I love serving a variety of fun party appetizers when we tailgate at home. If you ask me, it’s the best part of watching the game! Of course, I like to make sure we have our favorite sodas available, and there are plenty of varieties of Dr Pepper to satisfy everyone in my family–diet for me, classic Dr Pepper for my boys, and Dr Pepper TEN for my husband. 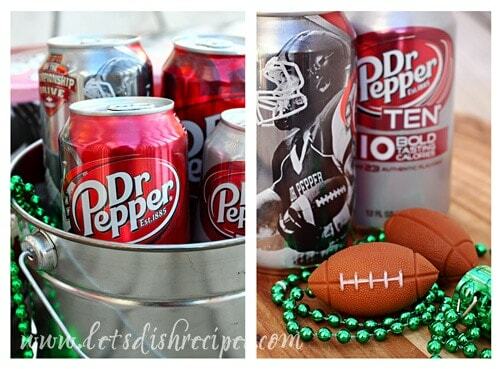 And the limited edition College Championship Dr Pepper cans that are available right now add a bit of flair to any football themed party or get together. 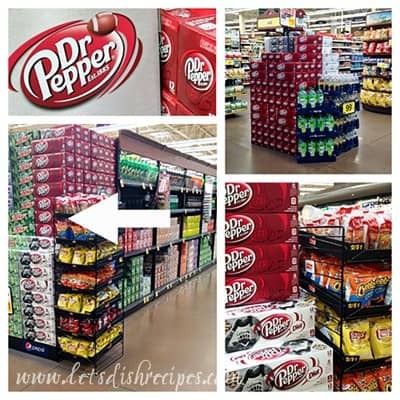 I recently picked up a few varieties of Dr Pepper during my weekly shopping trip to our local King Soopers grocery store. Of course, being a food blogger, I also make several pit stops there during the week. I’m sure some of the cashiers think I’m there every day! The limited edition Dr Pepper cans were really easy to find, displayed on the endcaps at both ends of the soda aisle. And right now you can save on Dr Pepper at King Soopers (Regular, Diet or TEN) with this coupon. 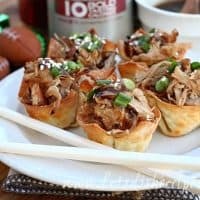 Great food is a huge part of tailgating at home, and these Pulled Pork Wonton Cups with Dr Pepper Glaze are the kind of appetizers that your family and friends will remember. 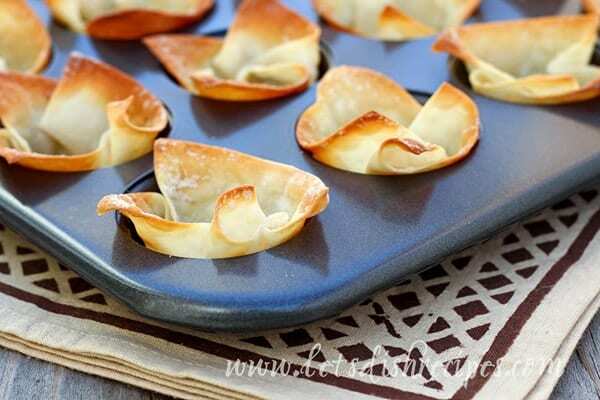 Making the wonton cups is so easy! You just press prepared wonton wrappers into a mini muffin pan and bake them for about 10 minutes. Once the wonton cups are cooled, they’re filled with a delicious pulled pork that’s been cooked in a savory mixture of Dr Pepper and Asian seasonings. I like to place the shredded pork under the broiler for just a few minutes. It ads so much flavor and a great crispy texture to the meat. 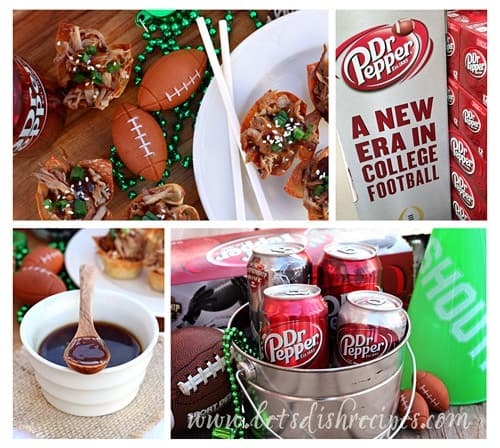 The real star of these tasty game day snacks is the sweet and savory Dr Pepper glaze. It takes about 5 minutes to cook and is what makes these pulled pork wonton cups so unique and delicious. We also love it as a dipping sauce for egg rolls, and it would be amazing on sliders and wings! I toss some of the glaze with the pork before filling the wonton cups and then reserve some for drizzling on top. Then I add a sprinkling of sliced green onions and sesame seeds. I’ve also used the glaze on roast beef and received rave reviews! Whenever I host a game day party, I like to add a few football themed decorations to my table. Since tailgating at home is usually a pretty casual affair, you really don’t have to go to a lot of trouble. Just a few footballs in different sizes, and some beads or whistles in team colors are all you need to make the big game memorable for your family and friends. If you want to go all out, pick up some plates and napkins with a fun football theme. 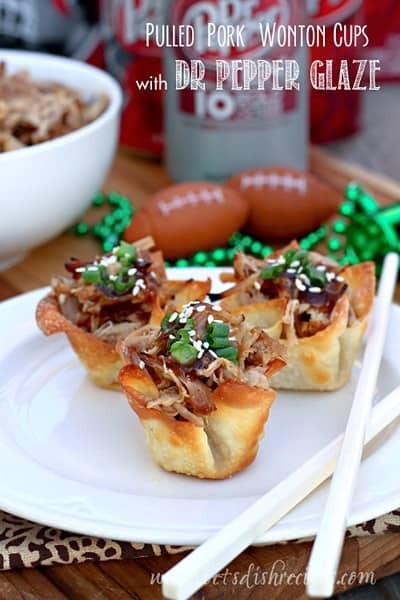 These Pulled Pork Wonton Cups with Dr Pepper glaze are definitely a new game day favorite at our house. 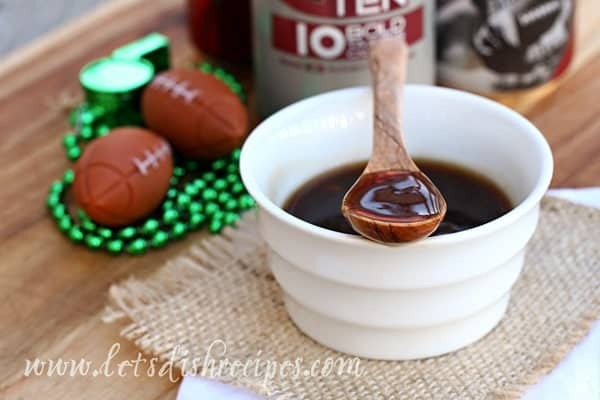 There are several steps in the recipe, but they’re all pretty simple, and any or all of it can be made ahead and reheated on game day. Carefully place a wonton wrapper into each section of the tin and press against the bottom and sides to form a cup shape. Spray the tops of the wonton cups with a light layer of non-stick cooking spray and sprinkle with salt. Bake for 7-8 minutes until light golden. Cool completely. To make the pulled pork, place the pork tenderloin in a lightly greased slow cooker. Season generously with salt and pepper. Whisk together the Dr Pepper, garlic, soy sauce, ginger and red pepper flakes and pour over the pork. Cook on low for 4-5 hours. Meanwhile, prepare the glaze by whisking together the Dr Pepper, soy sauce, brown sugar, rice vinegar, garlic, ginger, red pepper flakes and salt and pepper in a medium saucepan. Stir together the cornstarch and water and whisk into the Dr Pepper mixture. Bring to a boil over medium heat, whisking frequently until mixture thickens. Set aside, reserving 1/2 cup of the glaze for serving. If necessary, reheat glaze in the microwave briefly just before serving. Preheat broiler. 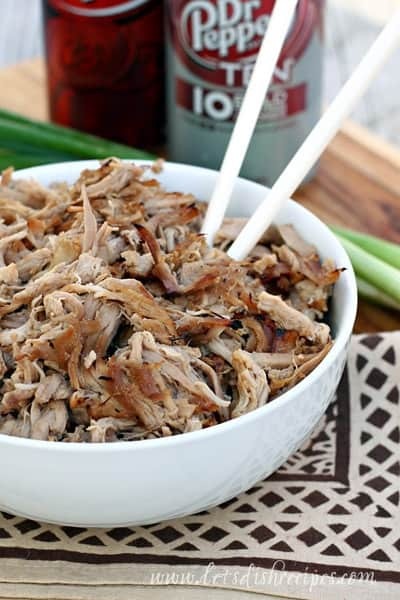 Shred the cooked pork with two forks and spread in an even layer on a parchment or foil lined baking sheet. Place under broiler for 3-4 minutes or until pork starts to brown and crisp around the edges. Toss the pork with all but 1/2 cup of the glaze and 1-2 tablespoons of prepared Thai peanut sauce. Fill the prepared wonton cups with a generous amount of pork filling. Top with reserved glaze, sliced green onions and sesame seeds. Serve immediately. What are your family’s favorite game day eats? Oh my – you know how I feel about pulled pork. WOW those look incredible Danelle! Hope you had a wonderful holiday – Happy New Year! hugs!!! I love the mini appetizers with the Dr Pepper glaze. They are a great idea for the big college game! Those are the cutest thing ever! I want to make wonton cups for everything now!